On Saturday, March 22nd, students, teachers, and families gathered for Forest View’s annual landscape day, working together to improve our school gardens, playgrounds, and natural spaces. 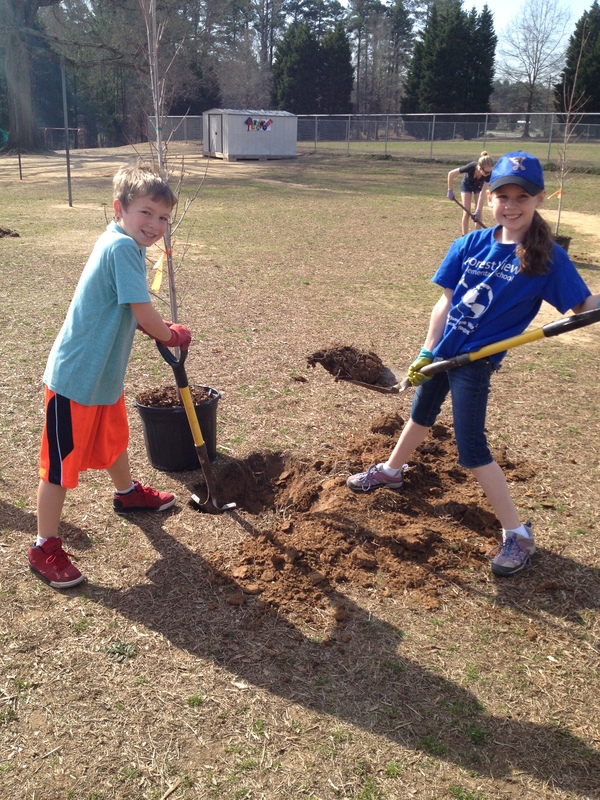 Thanks to Trees across Durham, we also planted 20 new trees! Sustainability specialist Megan Carroll with Greener Durham taught us about caring for the trees and introduced us to a new program focused on making Durham a more sustainable community: Charge Ahead Durham. This program offers a fun and easy way to help Durham families save energy, reduce waste, conserve water, and connect with nature—making our community the best it can be. Learn more about ways you can participate and help protect our natural environment here. Looking for other ways to teach children about their environment? Durham’s Earth Day Festival will be held on Sunday, April 27th from noon-5pm at Central Park. Find more information here. Special thanks to art teacher Marylu Flowers, Linda Foreman, Michelle Hughes, Megan Carroll, and to all the teachers and families who made this event a success.